One of the main benefits of our market place is that when advertiser buys text links, we do not charge them in advance. What it means is every time you buy links, you are going to be charged only for the time when links are actually live. For example if you bought text link ads on several pages and some of them have to be placed manually. You will not pay for those links until they are physically available. If you decide to remove your text links after couple of days, you will be charged only for days, when your link was live. We want to emphasise that you do not have to pay for the whole month in advance as you do at most other text link brokers. 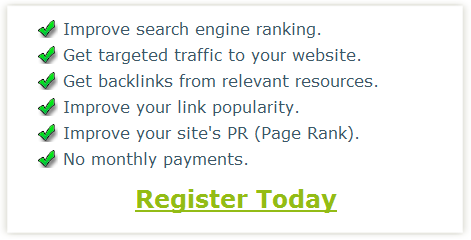 As an advertiser you can buy links to improve natural search engine ranking. Everybody knows that to get higher position in search engines, you need to build backlinks to your website. There are different ways for building links and you should never stick to only one technique. That is why more and more webmasters buy text links as a part of their link building strategy. When you buy text link ads, it really provides you with the best possible results in the shortest time. Building links manually is a very time consuming exercise and it can take months until you see any results. At the same time, when you buy backlinks and mix them with other natural links, you will see great results in a matter of weeks and even days. Our convenient system allows advertisers to buy links on pages with a manual link placement, which means, that if you are afraid of search engines recognizing automated links to your websites, then this is a way forward for you. All one way text links purchased on link pages with manual link placement will be placed by publishers manually. At the same time we have worked very hard on our security model for text link ads with automated placement, so there is no chance that search engine bots can recognize our backend script, which places text links on publishers' web pages.